1.5" Quikrete 5000 top supported by some 4x4s, 1x4s, 2x4s, and 1x10s. First post and first time casting concrete. I started out in Sketchup to get everything to fit and then started building. Let me know what you think. Wow. Great craftsmanship. I like it. 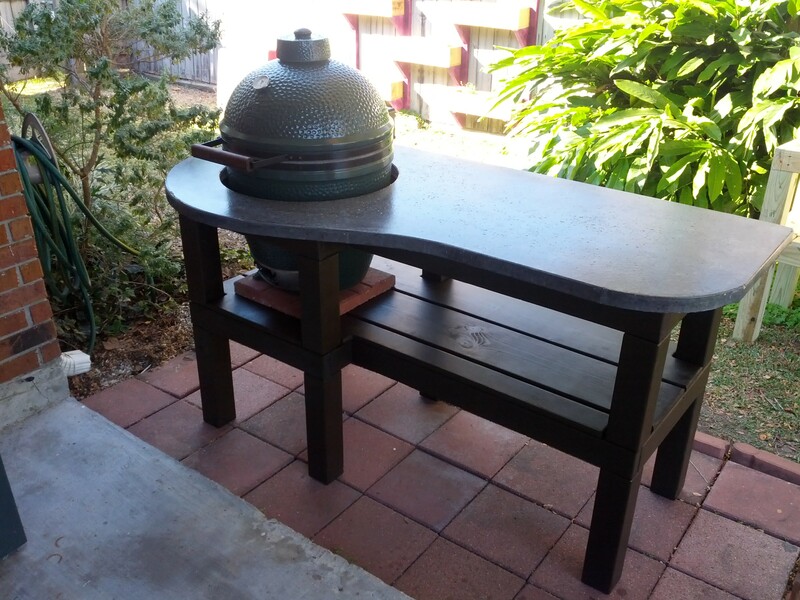 It'll be loads easier to clean than my standard BGE table. My table looks like I dumped coal and grease on it and its only a few months old. Sorry for the dbl post. Forum was acting up. Yes can you give us some more details? Anything you might do different? 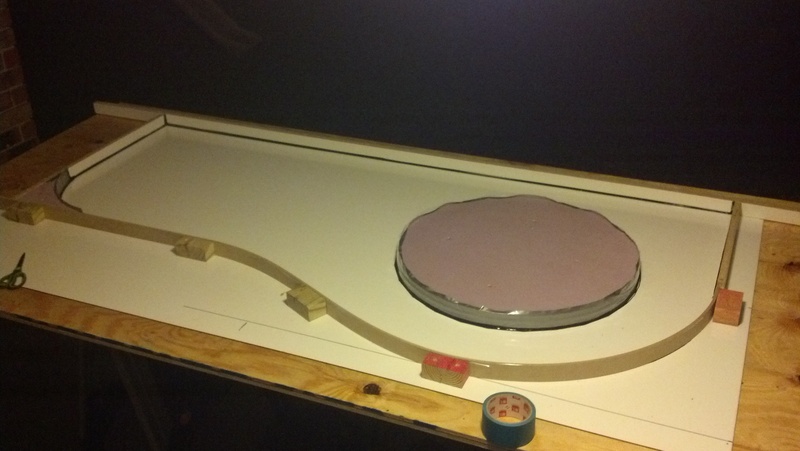 The large curve on the front was created by ripping a 3/4"x4"x8' piece of mdf into a 1.5" strip. 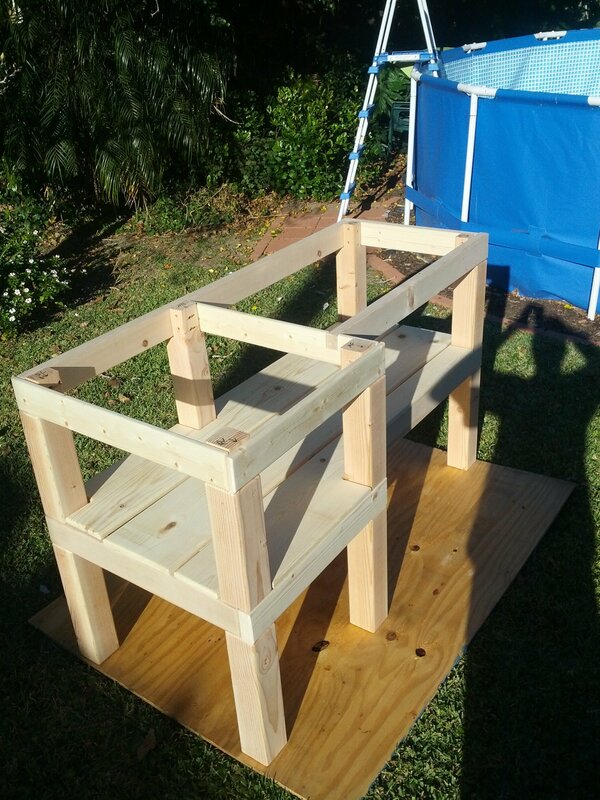 I then counter sunk 1" screws through it into the 2x4 blocks that were secured to the table form. After all that was setup and I had it laid out correctly I covered the inside of mdf with a piece of clear packaging tape to make it water resistant. The small curve opposite of the egg was done using 3 pieces of .5" foam covered in duct tape and then again in packaging tape. After all the pieces were set up I ran a bead of black silicone around all the edges to create a smooth transition. If I did it over again I would vibrate A LOT more. 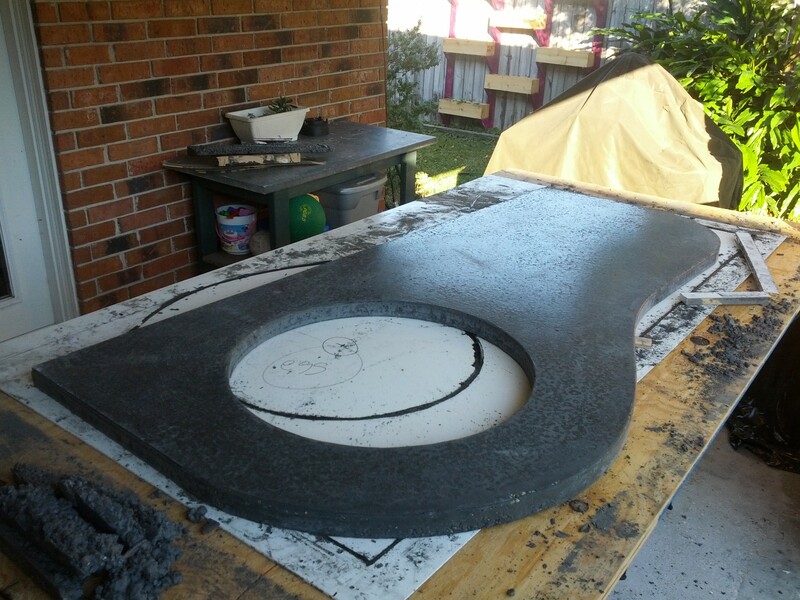 I used an orbital sander with the disc removed to vibrate the form. I thought I vibrated a lot but it turned out to probably be the minimal amount. If I make another top I'm going to try using a 3" mini buffer from Harbor freight with an off weighted wheel screwed to the table and left on until the concrete sets. I ended up with a lot of bubbles ranging in size from 1/32" circles to 1/2" x 1 /4" on the table surface and sides when I removed it from the mold. I rubbed grout into all the all the holes but they are still around 1/16" below the surface level. 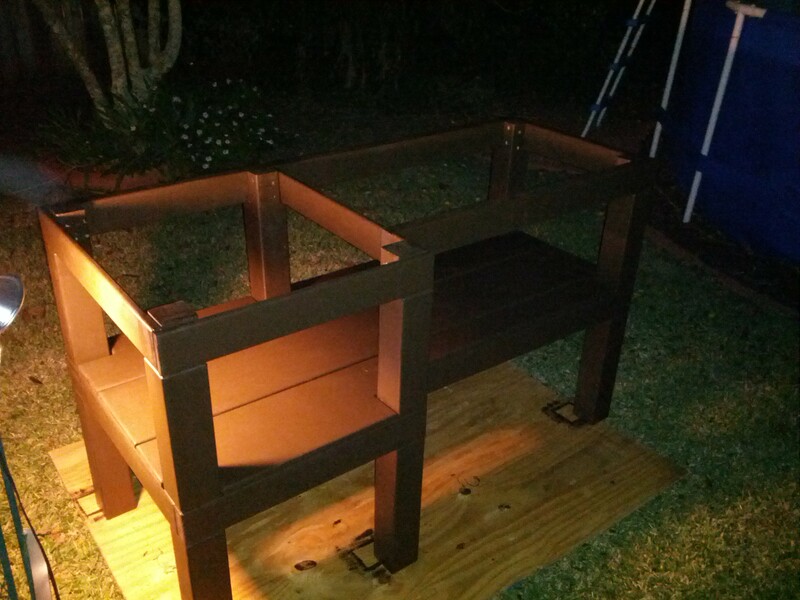 I sealed the table with Skigard High Gloss concrete sealer from home depot. I'm not sure if it was the best choice but it was the only choice Home Depot had. The second thing I would change is how clean my silicone lines were, I thought they looked nice when I made them in the form but the concrete really copies EVERYTHING and they could have been much nicer in some areas. 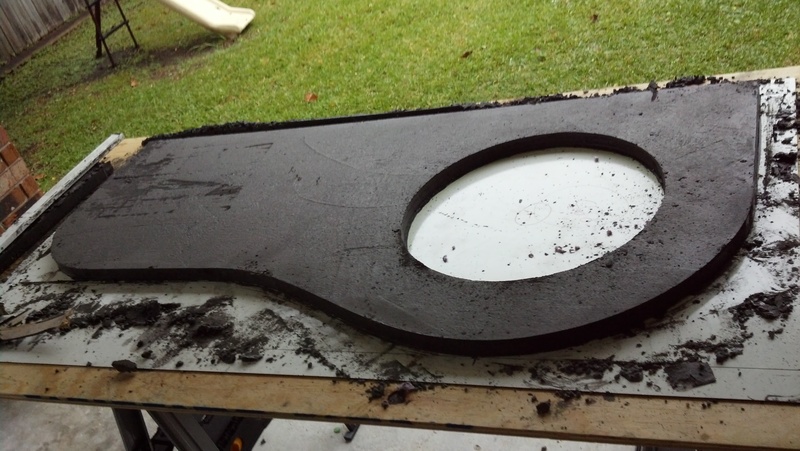 The concrete was dyed using 1 bottle of Quikrete charcoal liquid die for two 80 lb bags of concrete. It took around 3.5 80lb bags to cast the top. I also laid some 6x6 rebar mesh in the mold before I cast the concrete but forgot to get a picture of it. It weights around 280lbs and we easily moved it and set it in place with 5 guys. Very nice design. You have a good eye. Very, very nice. I'm chomping at the bit to make some concrete counter top. I have the cement mixer and wet grinder and a whole brand new set of diamond pads ranging in grit. Only I don't need an egg table. I'm thinking maybe some outdoor cooking station. 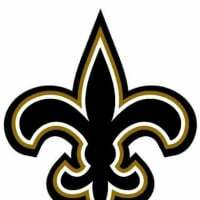 I'm also in New Orleans, let me know when you want to give it a try. cool, what part of town you live in? I'm in the point. Love the curved top. It makes me want to redo my rectangle concrete top. You can really be proud of that table. How did you attach the top to the frame?? The top is just resting on the frame right now. It weights ~280lbs and doesn not move very easily. If it becomes a problem I'm going to silicone blocks to the concrete and then screw those to the frame. I think you would be fine to just put silicone on your frame and set the top on. If I glue the blocks to the top and then screw them to the frame it will be easier to take it apart if I ever have to move it. 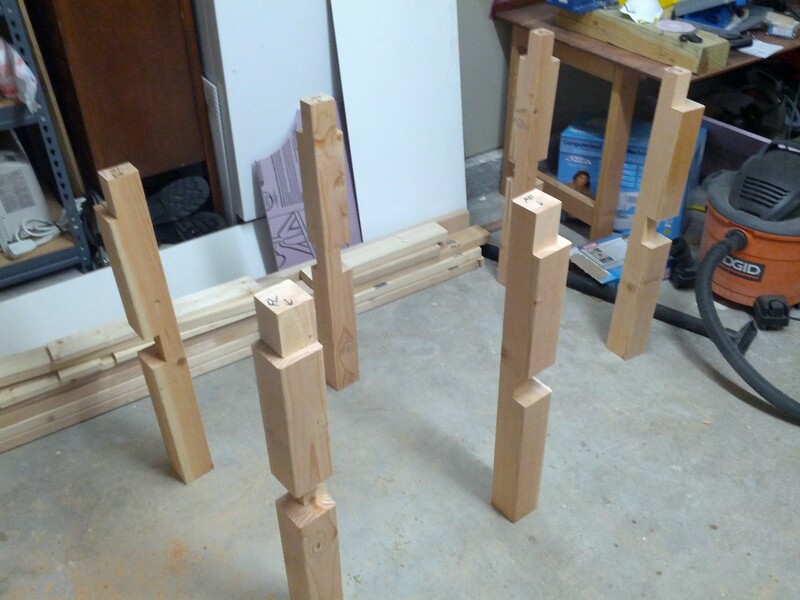 I plan on putting the blocks on the interior of the top of the frame so they won't be visible. If I glue the blocks to the top and then screw them to the frame it will be easier to take it apart if I ever have to use it. I plan on putting the blocks on the interior of the top of the frame so they won't be visible. Great looking table. I love the concrete top. 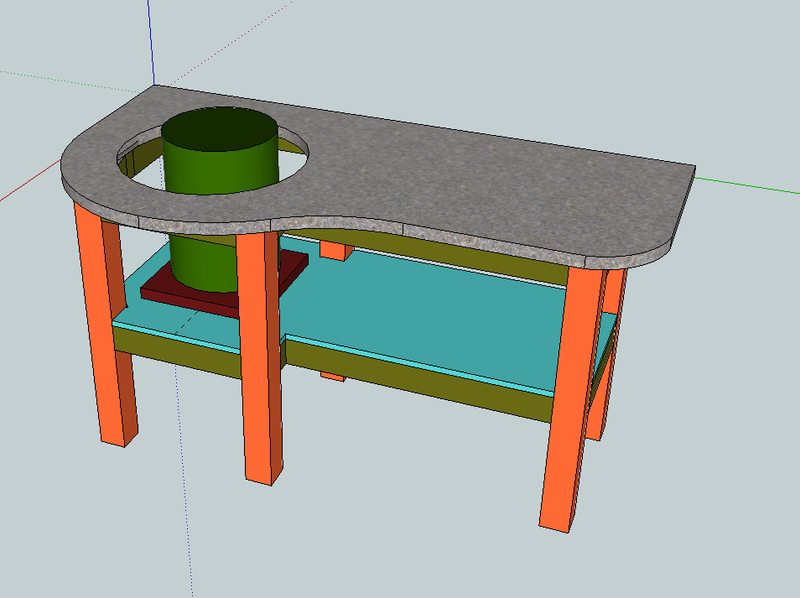 For my future reference, would it work to cast blocks into the concrete for attaching to the base? My plan is to, ultimately build an outdoor kitchen when I get me second BGE. @Optiontrader - you can cast tabs into the top to use to attach to the base. They need to be L or T shaped. Casing a brick into the cement isn't going to be strong. They cast "J bolts" into concrete to attach structures all the time. You can also cast in right angle brackets if they aren't too wide. Just make sure they're buried in the middle of your cast for strength. Thanks for the info. I want to have a well thought out plan, for when the time comes. Very nice table. I can't wait to make one myself . . . one day. First I have to rebuild the deck that the table will sit on. Such is life. Great craftsmanship. Nice looking table. That table top looks great. I like the modern looking curves on it. Harbor freight has a polishing kit with different grit wheels that you can use to clean up the edges if your silicone marks need smoothing out.